What is the Security Tab? In the Feature Editor the Security Tab allows you to set a requirement that all users need to log-in to their in-app profiles before accessing that section of the app, as well as set required Security Tags which will allow or deny access to a user based on the tags applied to their profile. Security Tags give you the ability to allow or deny access to a user based on the User Tags that are applied to their in-app profile. 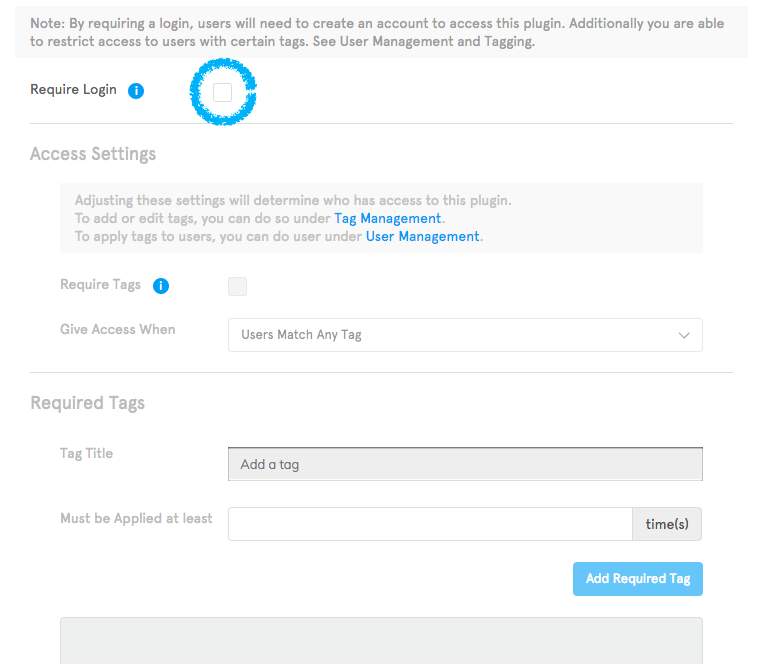 You can specify which tags are required for a user to have in order to gain access to that plugin in the Security Tab. If a user doesn’t have the required tag applied to their profile, they will receive an “Access Denied” message when trying to access that section of the app. 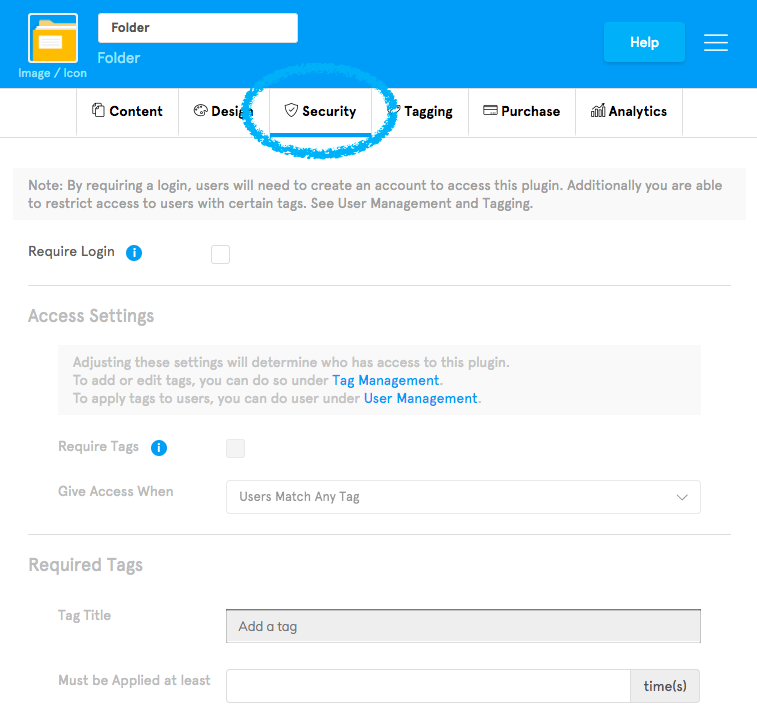 If you are looking to use tags for analytical reasons, you’ll want to use Behavioral Tags which you can set up in the Tagging Tab. If you would like to learn more about User Tags in our system and how to apply them to your app’s users, you can do so here. Note: Security Tags and Access Settings are only available on our Professional level plans and above. What are some use cases of Security Tags? If you’re creating an app for a school, you can secure content that’s for faculty only using Security Tags. When working on a fitness app you can use Security Tags to lock premium workout content behind Security Tags. If you’re building an app for your company, you can use Security Tags to segment content for the different departments of your company such as Administrative, Sales, Support, etc. What is the Security Tab’s primary function and what are the steps to accomplish it? The Security Tab gives you the ability to require that users log-in to or register for an in-app profile in order to access some or all of your app. Additionally, you can also set up specific User Tags that are required over and above the log-in for access to that section of your app. First let’s go over how to require a user to log-in, then we’ll go over how to set up Security Tags. When you’re working on a plugin that you’d like to require your users to log-in to their in-app profiles to gain access to, click on the Security Tab in the Feature Editor. Once you’re in the Security Tab check the box next to “Require Login”. This will force users to either log-in to their pre-existing in-app profile, or to register for one to gain access to that plugin. If you would like to add additional security requirements, you can do so with Security Tags. Before we go over how to set up Security Tags, you will need to make sure that you’re on the Professional-level plan or above, and already have “Require Login” enabled for the plugin that you’re working on. Once you’ve checked the box next “Require Login” go ahead and check the box next to “Require Tags”. 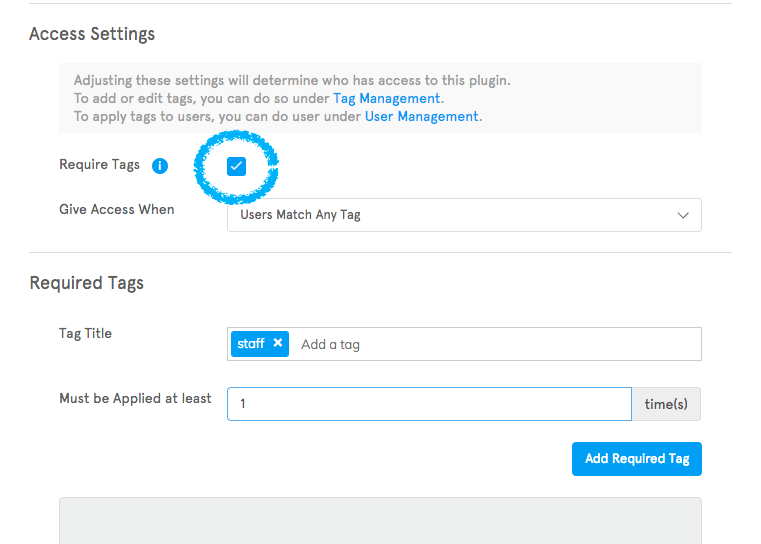 Users Match Any Tag: If you select this option and you have multiple tags applied to the plugin, as long as a user has at least one of those tags applied to their profile, they’ll gain access. Users Match All Tags: If you select this option and you have multiple tags applied to the plugin, users need all of those tags applied to their profile in order to gain access. Once you have checked the box next to “Required Tags” and selected the tag requirement that you want, type the name of the tag that you want to use in the “Add a tag” field. Note: if you have spaces in your tag name they will automatically be removed, so we recommend typing in the tag name as one word such as “CoolGuy” instead of “Cool Guy”. After you’ve entered in the tag name specify how many times that tag has to be applied to the user’s profile in order to gain access in the “Must be applied at least...” field. You can set up our system to automatically apply Behavioral Tags to a user’s profile. So let’s say you want only users who have opened the Social Wall plugin ten times or more to gain access to this portion of the app. All you’d need to do is type in the Behavioral Tag that you set up for the Social Wall into the required tags field and type a “10” into the “Must be applied at least…” field. If you would like to learn more about Behavioral Tags, you can do so here. If you don’t have any Behavioral Tags set up and you only want to use the User Tag as a Security Tag, then we recommend you type in “1” as the Security Tag will be manually applied to authorized users once by you. Now that you’ve specified the Security Tag that you want to use, and you’ve specified how many times it has to be applied to a user’s profile for access, click on “Add Required Tag” to add that tag to the plugin. After you’ve added the tag to the plugin, only users who are logged-in to their profiles and have the required tags will be able to access that section of the app. Note: You will want to make sure you click “Publish” at the top of the Dashboard in order to push out these changes to the live app. If you would like to remove a required tag, all you need to do is click on the “remove” button next to the tag. All of our stock plugins have a Security Tab, so you can Require Log-in or apply Security Tags to any of them. Once you’ve added a Security Tag in the system, it will also show up in the User Tagging Page. What are some Pro Tips you should know about Security Tags to take your app to the next level? Security Tags are a powerful tool and need to be handled as such. Be mindful of where you apply Security Tags. On one hand you want to make sure the more information sensitive or premium areas of your app are secured, but on the other hand you don’t want to lock too many from using your app. Think about how the tags will be used before applying them, and make sure you’ve applied the tags to the correct users so that they can gain access to the areas of the app that they’re supposed to be able to. In the Side Menu Page you can adjust the Secured Features option to show or hide plugins with security settings. This is a great way to hide administrative-only plugins or plugins with premium content in them so that only those with the correct permissions can see and access them. If you would like to learn more about the Secured Features in the Side Menu, you can do so here.